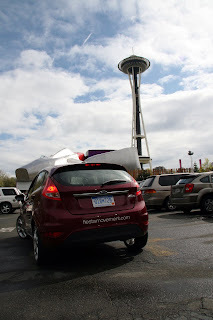 After leaving training and receiving our brand new Fiesta, we made our way to the Space Needle, just to say that we saw it. The rain that had visited us during our 'test drives' had now completely departed and the sky was amazing. The Space Needle looked almost like a painting against the fluffy white clouds and brilliant blue sky. We took some pictures of the Fiesta in front of the Space Needle and a few other shots around the area, bought a few souvenirs and then began our long ride home to Southern Oregon. It took us about 20 minutes to finally find an on-ramp and get on the road to Portland. Forty minutes outside of Seattle, the weather suddenly changed and the freeway was now better used for boating. Everyone slowed to about 30mph. The Fiesta handled it great, even with the summer tires. Our favorite feature had to be the windshield wipers (automatically) kicked into high speed and changed with the weather variation. The monsoon like weather continued for about 10 minutes and then it was like it never stormed at all. After driving for about three plus hours we decided to stop over in Portland to visit Brad's brother and show-off the car. He was pretty impressed, which is hard to do with him. He and his girlfriend, were both wary of all of the technology in the car. They much prefer the hand cranked windows and door locks that only work when you press them. 'Less that can go wrong,' they said. We tried to convert them to the 'modern day conveniences' and showed off the automatic windshield wipers which again was a big hit. We ended up staying overnight in Portland, after enjoying a great meal and telling stories about our two days of adventure so far. Couldn't wait to get back on the road and see what else the Fiesta could do!